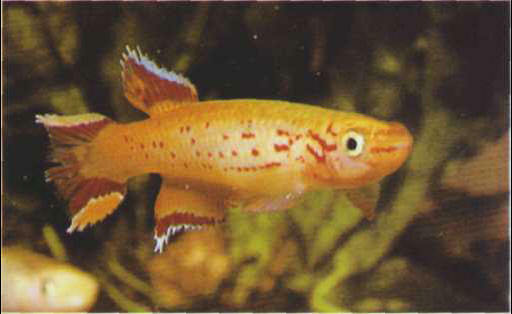 The Cape Lopez lyretail or the lyretail panchax is obtainable from most commercial outlets and is the species of aphyosemion most frequently recommended to hobbyists wishing to familiarize themselves with the genus. It is hardy, and spawns continuously without particular problems. Prepare a bed of peat in a small tank, introduce fine-leafed plants and keep the temperature below 23°C. The pH should be between 6 and 7, with almost zero hardness. The female lays 50-100 eggs, each only 1 mm in size, which hatch after 2 weeks. Remove any infertile eggs (cloudy instead of transparent). Hatching can be accelerated by raising the level of dissolved CO2 (carbon dioxide) - a technique also valid for other species. One way to do this is by blowing gently down a tube into the water. Size: 6 cm. ФОНТЕНБЛО (Fontainebleau) , город во Франции, к югу от Парижа. 36 тыс. жителей (1982). Дворец и парк (16-19 вв. ; бывшая загородная резиденция французских королей). Национальный музей Фонтенбло. Близ Фонтенбло. - д. Барбизон - центр барбизонской школы с домами-музеями К. Коро и др. художников.